I'm an at-home mum of school aged children who makes beautiful Roman Blinds from home. I have low overheads and can pass those savings directly on! Roman Blinds customised to your specific window measuremen­ts. Most blinds will be completed within 3 weeks of my receiving your fabric. Email me today for a quote! 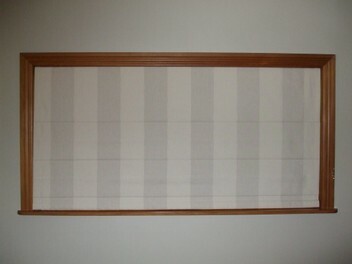 I make fabulous Roman Blinds from home where I can keep the prices low without compromising on quality. I've made 1000's of Blinds from an interesting array of fabrics. I'm commonly asked to re-model ready-made curtains into blinds. I've often used second-hand curtain fabric at my customers request, and I've even used old duvet covers. So don't be afraid to think outside the box! All my blinds come to you ready to hang on a sturdy wooden batten with all the fixings included. I make my blinds with brass rings, quality cording, fibreglass stiffening rods and use a combination screw-eye/pulley system at the top. A wooden toggle and silver cleat are included too along with either J-Brackets or L-Brackets. For customers living outside Auckland - don't despair! I'm happy to receive fabric by post and send completed blinds back to you. I think you'll find my prices are so competitive that even with the price of a courier you'll be saving! Please feel free to email me your specific window measurements for a price today. I look forward to helping in any way I can. Beautiful blinds and amazing, helpful, patient customer service. Thank you ?? Very occasionally you come across someone who deserves much more than the single 'thumbs up'. Andi is one of those special people. Sadly, due to size, I was not able to go ahead with the order. However, Andi provided exceptional advice and unfailing replies to my many many questions, and understood everything. Despite not being able to proceed, I am absolutely confident that Andi would have provided a top class product that would have any satisfied any discerning customer. Thanks so much Andi. Professional and beautifully made blinds. Very happy with customer service and patient explanation of how to install blinds. Highly recommend. Blinds can not be faulted. Thank you so much. Thank you Andi for the awesome service. I appreciate the great communication and that you made our blind from curtains we had no use for. The blind looks fantastic. Thank you Andi for the great work you did on my roman blinds. Easy to communicate and very friendly. I could not work out between inches or centimeter but Andi knew it straight away. Thank you once again. Really pleased with the blinds Andi made for me. They look fantastic and have really transformed the room. Thank you so much for quick friendly service. Highly recommend to all. Another order delivered, well packaged, neatly packaged, I would imagine that Andi`s work place is just as neat & orderly. Cannot recommend highly enough. About to order my third lot of blinds. Others turned my orders down due to flimsiness of fabric (organza like) Andi has no trouble. Very flexible and accomodating. Andi was more than willing to make blinds from existing and pre-made curtains so we could get matches (other won't!) Her pricing was excellent, about 1/3 the quoted cost of the likes of Spotlight etc. Very cheap, very fast, very good quality--overall, incredibly happy with the result! Fantastic service. Great price. Thought turnaround time was good when placed order, but Andi beat it! Thank you again. Andi has just made my third set of Roman Blinds - making a total of 10 blinds so far. Once again superb service, friendly knowledgable advice - nothing is too much trouble. She is so professional and talented. Thanks again Andi. Really pleased with our blinds. Outstanding pattern matching, thread matching and quality. I can tell that Andi enjoys doing the best she can for her customers. Andi was so great to use, she was so friendly and helpful when we asked how to measure our windows. The blinds were packaged so well and the blinds fit our windows perfectly and the quality is great. Will definitely use again and recommend. Fanastic! Fast, friendly service and excellent workmanship. Highly recommended! Great quality and value. Would strongly recommend. Thank You Andi The blinds are perfect !!! : ) Your workmanship and presentation of your finished blinds is top quality. Your excellent customer service made it a pleasure to meet you and a delight to recommend your service when ever I can. If you're hunting for the perfect person to make your roman blinds for your home, stop looking and call Andi! She is truly the BEST! She is so easy to deal with, quick communication and advice, the hardest part was finding and choosing the fabric! We have white, wooden venetian blinds installed in our home and are now enjoying the warmth and darkness thanks to Andi's roman blinds to compliment them. Everything came packaged beautifully, with clear instructions on how to hang, it was so easy! So happy with my blind. Andi was very helpful and obliging. Great communication.